Yesterday I got a chance to meet Kuya Ef once again for the Golden ABC's corporate social responsibility launch entitled "GET UP". As a country's fashion pioneer and owner of the leading brands like Penshoppe, Oxygen, ForMe, Memo and Regatta they are keeping their responsibility in building our country, a better place to live. 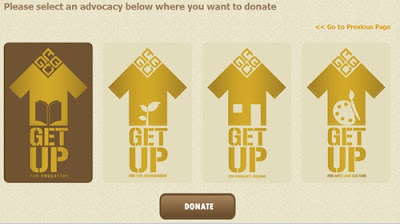 For this "Get Up" was launched together with Executive Director of Children's Hour Gee Mayuga, Dynamic Teen Company founder Kuya Ef, Marketing Head of Gawad Kalinga Eena Meloto, CEO of Habitat for Humanity Ricky Jacinto,Pinky Aquino-Abella of Aklat Gabay Aruga Tungo sa Pag-angat at Pag-asa(AGGAP), Vice Chairman and CEO of Wildwife Foundation Lory Tan and Nina Lim-Yuson the Chair of MUseo Pambata. Now everyone can help while shopping, yes you heard that right. Shop through Golden ABC's brands for a minimum of 1000Php single reciept purchase 25Php will be donated for the advocacy of your choice weather education, environment, arts&culture and community building. You can also see a donation tally and something cool after the donation process. Enjoy...Here's how you can help. Purchased a minimum of 1000Php, visit www.getup.ph then press donate and the rest will guide you through. In celebration of its 25th year, GOLDEN ABC would like to engage its customers in raising awareness to the various advocacies the company is supporting. 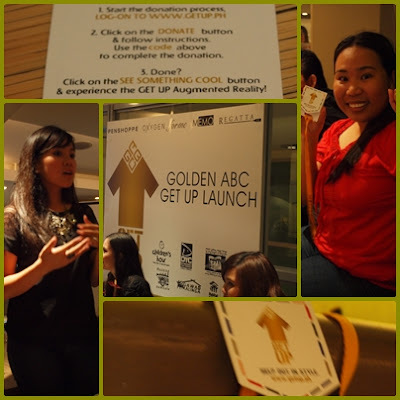 Taking it a step further, GABC through its brands is giving a chance for its customers to donate to any of these advocacies and their corresponding partner institutions. Let's all GET UP NOW! !